It’s 1941 and as an empire is swept away, a young woman’s world is ripped apart….. In spite of the shape of her eyes and the origin of her ancestors, 17-year-old VictoriaKhoo thinks of herself as an English rose among Chinese thorns. With her head buried in the pages of Mrs Humphry’s Manners for Women and Jane Austen, Victoria’s carefree days are spent practising the proper etiquette of a modernEnglish lady and fantasising about marrying her Mr Darcy, Sebastian Boustead – scion of a great British merchant family. Not even Sebastian’s arrival from London with his new fiancée, Elizabeth Nightingale, can dampen her dreams of becoming mistress of his imposing mansion on Amber Road. She has no time for talks of military tactics and navy bases – that is until the war reaches Asia and ‘Fortress Singapore’ abruptly surrenders to the Japanese. As the inhabitants are deserted by Britain, Victoria is forced to protect both her family and her rival, Elizabeth, from the cruelty of the occupation. But how far will she go to save the people she loves and fulfill her destiny on Amber Road? 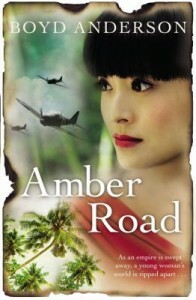 A sweeping historical saga on the scale of Gone With The Wind, Amber Road is a beautiful coming of age novel set in Singapore against the cataclysmic final months of World War II. This entry was posted in Australian Authors, Historical Fiction and tagged Author Talk by admin. Bookmark the permalink.